Exor’s 40+ years of experience have led them to their flagship offer. 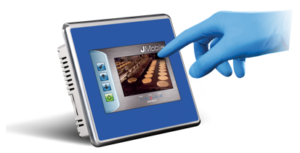 JMobile Configuration Software, Series 500 Resistive Touch HMI, and Series 00 “True Glass” Capacitive Touch HMI. 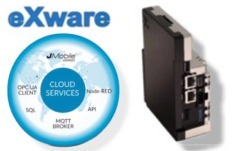 JMobile, alongside their 4+ decades of manufacturing excellence, offers industries’, connectivity, and portability; Web & Network enabled HMI solutions for secure control and data, anywhere, from any device. Exor’s “modern” tool set allows for crafting a more visually appealing, better “User Experience”. The eSMART series of products combine the power of Jmobile with an outstandingly robust design. The eSMART has been stripped down to only the essential components. While maintaining a IP66 protection rating for the front of the unit and is approved at cULus level. Pending we have UL Class 1 Div 2 and ATEX Class 2/22, allowing use in the most hazardous of environments. Modern glass screen HMI with Muti-Touch and gestures. A beautiful product, with tremendous technical flexibility backed by a company with 45 years in the industry and with a market price similar to previous models. The eX700 Series represents a ground breaking product to come to market. It includes the Revolutionary IIoT Controller. IP69K Food and Beverage HMI from Exor is Acid Chemical Resistant to Sodium hydroxide 50%, Ammonia <32%, Sulphuric Acid 30% and Acetic acid <50%. High Pressure 80°c Water Resistant, Stainless Steel Bezel Design, Food Compliant Gasket, FDA 21 CFR 177.2006, DIN EN1672-2, EHEDG. Protective front foils is made with high-quality polyester that withstands exposure of more than 24 hours duration under DIN 42 115 Part 2. The eTOP Series 500 Glass is the ideal choice for extreme, outdoor, marine, automotive applications. IP69K – extended temperature range ( -20°C +60°C), ATEX, UL and DNV approvals. 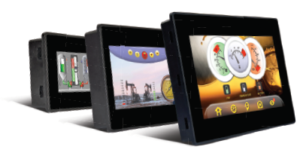 Integrated solutions HMI+PLC are ideal for compact applications.The optional plug-in modules are compatible with eTOP Series 500, Series 600, and eBIS500. The excellent price/performance ratio will make it the ideal solution for many of your control projects. 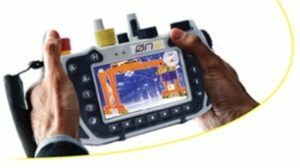 JMobile is a modern & innovative software solution for the design of HMI applications in a simple and intuitive way. A powerful and versatile tool set allowing for the rapid design of tailored applications crafted for a better, more modern user experience.